JETCOAT Concrete Sealer is a professional grade 100% Acrylic water-based clear drying emulsion. It is designed to seal and protect both interior and exterior concrete surfaces. Driveways, patios, sidewalks, pool decks, floors, quarry tiles, paver bricks, brick surfaces, masonry, and more. For interior and exterior use. Clean Concrete Surface - Sweep all dirt and loose debris from concrete surface. Scrub all oil and gasoline stains with household detergent and water. Rinse off entire concrete surface with water and allow to dry thoroughly before applying concrete sealer. Clean and Fill Cracks - Remove dirt and vegetation from cracks with screwdriver, wire brush or other suitable instrument. Clean out cracks with hose and water and allow to dry. 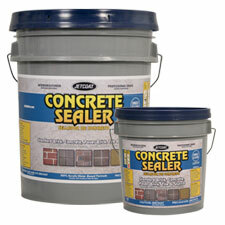 Fill cracks up to 1/2” wide with JETCOAT Pourable Concrete Crack Sealant. Fill larger cracks up to 1” wide with JETCOAT Concrete Patch. Allow crack filler or patch to dry 24 hours prior to applying JETCOAT Concrete Sealer. Applying Concrete Sealer - Stir pail thoroughly. JETCOAT Concrete Sealer is ready-to-use. Do not dilute. Apply a thin even coat of concrete sealer with a roller, brush, or garden type sprayer. For best results apply at a rate of 200 square feet per gallon per coat. Additional coats may be applied to create a higher gloss surface. This product does not contain any California Proposition 65 Chemicals. 66805 4.75 gal. Pail 46 lbs. 66801 .9 gal. Pail 9 lbs.